EPIC! "@CFL: What a time @TheMapleLeafUK w/the #GreyCup &amp; @HenryBurris celebrating #Canada150! #BringItIn #CFL pic.twitter.com/HTyAd1oD9H"
It’s July 1, which means Happy Canada Day to Bobby Bonilla, who retired as a baseball player in 2003 and last played for the New York Mets in 1999. But his contract called for him to receive US$1,193,248.20 every July 1 through 2035. . . . And how much will your bank account grow by today? In looking back at all that happened during the NHL’s draft weekend in Chicago, the move that may have the biggest impact on the 2017-18 season was the Pittsburgh Penguins’ acquisition of tough guy Ryan Reaves from the St. Louis Blues. The Penguins won back-to-back Stanley Cups without a bodyguard for Sidney Crosby and Co. Will Reaves’ arrival in Pittsburgh signal the start of an arms race? Of course, the Detroit Red Wings tried to play for a number of seasons — post-Bob Probert and Darren McCarty — without a bodyguard for the likes of Pavel Datsyuk and Henrik Zetterberg. And we all know how that turned out. It seems that every CFL season is the same as the last one. Observers are critical of the officials for throwing too many flags. But why are those same observers to reluctant to point fingers at coaches for the lack of discipline being shown by players who put the officials in positions where they can call those penalties? Wonder Woman and I journeyed to Kelowna on Friday, a trip we always enjoy. Yes, dinner at the Old Spaghetti Factory was terrific. But, I’m here to tell you, the Kelowna traffic crawl is right there with that of the Lower Mainland. We also were left to wonder if there was anyone left at home in Alberta, or if the citizenry all had made the trek to the Okanagan. F Justin Feser (Tri-City, 2008-13) has signed a one-year contract with the Krefeld Pinguine (Germany, DEL). Last season, he had 22 goals and 30 assists in 45 games with Olten (Switzerland, NL B). He led the team in goals, assists and points. . . .
D Jesse Dudas (Lethbridge, Prince George, Swift Current, Regina, 2003-09) has signed a one-year contract with Nové Zámky (Slovakia, Extraliga). Last season, with Debrecen (Hungary,MOL Liga), had one goal and five assists in six games. He started the season with TPS Turku (Finland, Liiga), but was injured in the first Champions League game and never played in the regular season. . . .
F Keegan Dansereau (Calgary, Swift Current, 2003-09) signed a one-year contract with MAC Budapest (Hungary, MOL Liga). Last season, with Dunaújváros (Hungary, MOL Liga), he had 34 goals and 37 assists in 39 games. He led the league in points and was tied for the lead in goals. . . .
F Layne Ulmer (Swift Current, 1997-2001) has signed a one-year extension with the Cardiff Devils (Wales, UK Elite). An alternate captain, he had 19 goals and 33 assists in 51 games last season. Ulmer completed his MBA at Cardiff Metropolitan University during last season. . . .
D Mark Louis (Brandon, Red Deer, 2003-08) has signed a one-year extension with the Cardiff Devils (Wales, UK Elite). Last season, he had one goal and 12 assists in 45 games. . . .
F Carson McMillan (Calgary, 2005-09) has signed a one-year extension with Esbjerg (Denmark, Metal Ligaen). Last season he had nine goals and eight assists in 39 games. . . .
F Luke Lockhart (Seattle, 2007-13) has signed a one-year contract with Kunlun Red Star Beijing (China, KHL). Last season, with University of British Columbia (CIS), he had nine goals and nine assists in 28 games. Kunlun Red Star opens training camp today (Saturday) with three days in Beijing, and is to begin on-ice sessions in Switzerland on July 8. . . .
F Adam Řehák (Medicine Hat, 2011-12) has signed a one-year extension with the Invicta Dynamos Gillingham (England, National). In 27 games last season, he had 27 goals and 25 assists. He led his team goals, assists and points, while finishing second in the league scoring race. F Nolan Patrick, the second overall selection in the NHL’s 2017 draft, has undergone another surgical procedure. Ron Hextall, the Philadelphia Flyers’ general manager, revealed on Friday that Patrick won’t be taking part in the on-ice part of a development camp next week. The Flyers expect Patrick to “be able to resume full activity” sometime between mid-July and early August. This means that Patrick had surgery 11 days before the Flyers selected him during the draft in Chicago. "To me, that brought clarity to us in terms of what’s been nagging him the whole year,” Hextall told reporters on a conference call. “There was something there. For us it was almost — I don’t want to say it was a positive — but when you look at everything that happened to him during the year and in and out, now we know what the issue was." Patrick first was injured late in the WHL’s 2015-16 playoffs. He had surgery to repair a sports hernia in July 2016 and returned for the start of the WHL’s regular season. He played five games, the last one on Oct. 11, and then sat out until Jan. 13. He was injured again on March 17 and missed Brandon’s four playoff games as it was swept from a first-round series by the Medicine Hat Tigers. In the 33 regular-season games in which he was able to play, Patrick put up 20 goals and 26 assists. If Patrick doesn’t crack the Flyers’ lineup out of training camp, he must be returned to the Wheat Kings. 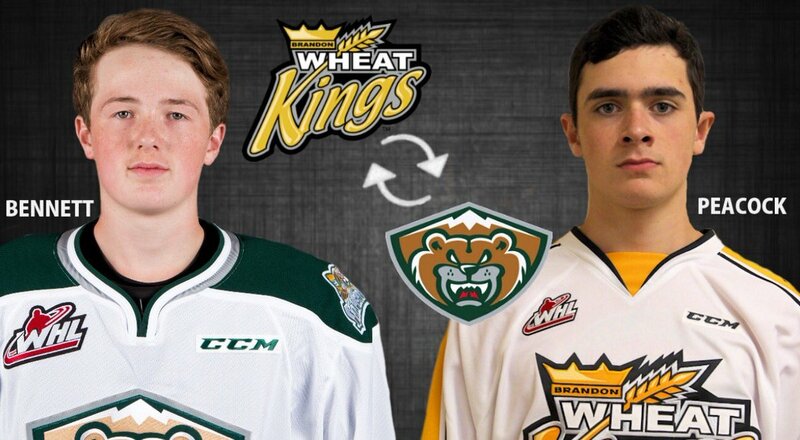 The Brandon Wheat Kings and Everett Silvertips swapped goaltenders on Friday, with Brandon Peacock, 17, heading west in exchange for Zach Bennett. . . . Peacock, from Quesnel, B.C., has played three seasons at the Okanagan Hockey Academy in Penticton, B.C. Last season, with the White prep team in the CSSHL, he was 12-6-1, 3.24, .896. The Wheat Kings selected him in the fourth round of the WHL’s 2015 bantam draft. . . . In mid-June, the BCHL’s Trail Smoke Eaters announced that they had signed Peacock for 2017-18. . . . Bennett, from Winnipeg, will turn 17 on Oct. 1. The Silvertips picked him in the seventh round of the 2015 bantam draft. Last season, he was 2.20, .936 with the midget AAA Winnipeg Thrashers, and he was a second-team Manitoba Midget Hockey League all-star. The BCHL’s Chilliwack Chiefs have added F Austin Wellsby, 20, to their roster. Wellsby, who is from Chilliwack, played the past three seasons with the WHL’s Kootenay Ice. Last season, he had six goals and 12 assists in 60 games. In 164 regular-season games, Wellsby had 15 goals and 20 assists. . . . The Ice selected him in the fourth round of the WHL’s 2012 bantam draft. Bram Stephen is the new head coach of the AJHL’s Spruce Grove Saints. He spent the previous five seasons with the Grant MacEwan College Griffins. Prior to that, he was an assistant coach for two seasons (2009-11) with the AJHL’s Drayton Valley Thunder. . . . In Spruce Grove, Stephen takes over from Michael Ringrose, who left as the organization underwent an ownership change in June. Chris Taylor has signed on as head coach of the Rochester Americans, the AHL affiliate of the NHL’s Buffalo Sabres. He replaces Dan Lambert, who was fired after one season as the Sabres underwent a regime change. Lambert has since signed as the head coach of the WHL’s Spokane Chiefs. . . . Taylor is a former Americans player and played three seasons (2002-05) with Jason Botterill, Buffalo’s new GM, in Rochester. . . . Taylor spent four seasons (2012-16) as an assistant coach with the Americans. Last season, he was an assistant with the AHL’s Wilkes-Barre Scranton Penguins.